WASHINGTON, D.C. – This is not an attack upon Pope Francis. There are many things that can be admired about him. However, a huge contradiction in his statements (and lack of statements) while here, regarding the sanctity of human life, is a head-scratcher that defies any moral imperative. The pope's visit to America had a huge impact on the entire world during his whirlwind 3 day tour of the U.S. 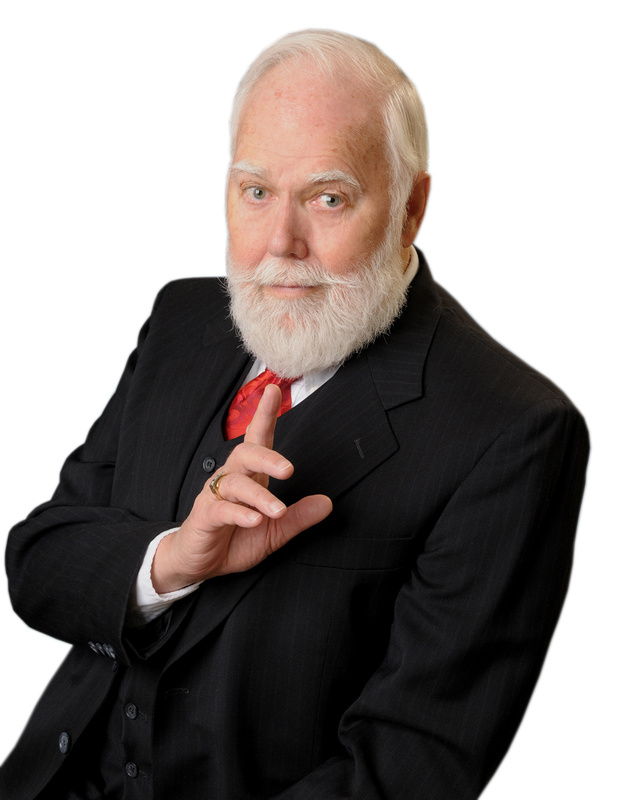 While he was curiously mum about the horrors of abortion and the carving up of newly aborted babies to sell their body parts, he instead, spent his time pontificating that the death penalty for hardened criminals should be abolished. He went on to declare that the death penalty has no place in a modern society. After all, criminals are human too and must be treated with care and compassion. How's that again? Vicious criminals, many who have cruelly murdered human beings, destroying lives of survivors forever, should be spared punishment, since that would make us barbaric? But little babies in the womb, who are totally innocent of any wrongdoing, are torn apart, limb by limb with no anesthesia (it has been proved ,they DO feel pain) simply because they are inconvenient? What is worse, the Communist Democrats voted down a law that would have given anesthesia to babies undergoing that horrific procedure, so at least, they would not suffer. But what is astonishingly lacking for democrats and the pope is any compassion for innocent pre-born babies feeling excruciating pain as they are torn apart, while exhibiting total compassion for murderers who coldly kill. This makes no sense. A petition has gone out and signed by thousands asking congresspersons and senators to defund Planned Parenthood for the atrocities committed at their "health care" clinics. We, the taxpayers, fund Planned Parenthood (murderhood) with millions of dollars given to them each year. Yes, we who totally disagree with this outrage are forced to pay for it. I was one who signed that petition. A copy went to Dianne Feinstein, California's Senator. She sent me back a polite letter which is very informative: Since there is a sizing problem that prevents the letter from being cut and pasted here, we will reproduce it word for word, with a highlighted comment on the misrepresentations by this senator. Thank you for contacting me regarding Planned Parenthood. I appreciate hearing from you, and I welcome an opportunity to respond. I understand you are concerned by recently released videos depicting Planned Parenthood representatives and affiliates discussing the donation of fetal tissue for medical research. The regulated donation of fetal tissue for medical research is a legal practice, and to date, it is my understanding that none of the videos released have demonstrated any unlawful activity by Planned Parenthood or its affiliates. It is also important to note that a forensics company uncovered that both the initially released and "full footage" versions of these videos are heavily edited and misrepresent their full contact. Excuse me Senator: You mentioned that DONATION of fetal tissue is legal. Planned Parenthood has a price fixed on every organ in the child's body...they are for sale and a lot of money has been brought in by selling these illegal body parts. This, Ms. Feinstein is NOT LEGAL! You also state as truth that a "forensics company" – chosen by democrat supporters of Planned Parenthood – state that these videos "are heavily edited and misrepresent their full content." NOT SO Senator. A real forensic specialist examined the tapes and stated that they were NOT edited. Lawful fetal tissue research has taken place in the United States for several decades, and has directly led to medical breakthroughs including the polio vaccine and innovative treatments for HIV and AIDS. Recent research has also yielded promising discoveries in treatment for Parkinson's disease, spinal cord injuries and diabetes. Since 1993, the Department of Health and Human Services (HHS) has been fully authorized to both facilitate and regulate these types of legitimate research. Again Senator, this research you described is and was NOT legal. Your next paragraph answers itself, yet you try to misdirect us to think the body parts of the aborted baby are DONATED. You may be interested to know that current law prohibits the sale of fetal tissue and imposes harsh criminal penalties for doing so. Tissue may be donated, not sold, and by law a woman must give written consent before donating fetal tissue. Consent may not be given or requested prior to a woman's decision to obtain an abortion, and the statement of consent must be made available to HHS for audit in order to verify compliance with the law. Women who have had an abortion have stated publicly that they would NEVER have given permission for their baby's body parts to be sold on the human organ market. Indeed, they were never asked. I understand that you support withholding federal funding from Planned Parenthood. Since coming to the Senate, I have consistently supported federal funding for reproductive health care under the Title X Family Planning Program, including Planned Parenthood. These funds do not go toward abortion services, and instead help to provide contraceptives, cancer screenings, and other health services to millions of low-income women and men. According to a report published by the Guttmacher Institute, these preventative services resulted in nearly 400,000 fewer abortions in 2013 alone, the latest year for which statistics are available. Senator Feinstein, you are trying to convince us that the money given to Planned Parenthood is strictly for reproductive health care, then you state that these funds do not go toward abortion services??? L I A R!! Furthermore, most of these cash cow abortions were performed on women with some money who simply did not want to have their life styles interrupted by having a baby to care for. Planned Parenthood's most prosperous product is abortion, even though Senator Feinstein denies that it even takes place there. I recognize that this is a topic of great personal importance for many people and that the debate on this issue has significant meaning to you. Please know that I respect your opinion and will be mindful of your views as the Senate continues to discuss this matter. You can bet that this is of great personal importance to me, Senator. And your fellow democrats so hate babies that they voted against at least giving them pain medication before cutting them to pieces. Again, thank you for writing. I hope you will continue to contact me regarding issues of importance to you. Should you have any further questions or comments, please do not hesitate to call my Washington, D.C., office at (202) 224-3841, Best regards. Senator Feinstein's letter, of course, makes me feel much better about babies being dismembered, limb by limb as they twist and squirm in horrific agony. It will be of interest to know that while Pope Francis was speaking for the rights of murderers to not be executed, 12,000 abortions were performed during his 3 days in the United States. 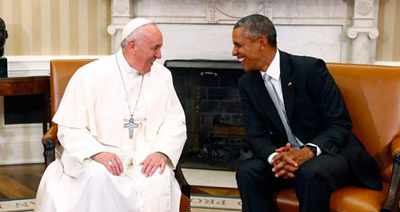 Photo Caption: Abortion Proponent Obama Enjoys Laugh with Pope.